It’s that time of year again – time for some spring cleaning! How better to clean up your stash than to use up the bits of yarn you have hanging around than to knit some of these fabulous stashbusters? Using less than one hank or ball of 2 shades of any chunky, bulky weight yarn, you can whip up this cute and cuddly headband in no time at all. It includes detailed instructions as well as two options for creating the floral embellishment; it includes patterns for both a knitted and crocheted flower. This is perfect as a holiday gift – and as knitters know, it’s never too early to start your holiday knitting! Whether you’re knitting a set for yourself or for a fellow yarnivore, this little gift set is absolutely adorable and perfect for any knitter. Using aran or worsted weight yarn remnants, you can create a small yarn basket, leaf shaped scissor case, a jumbo pin cushion, and a tree trunk measuring tape case. 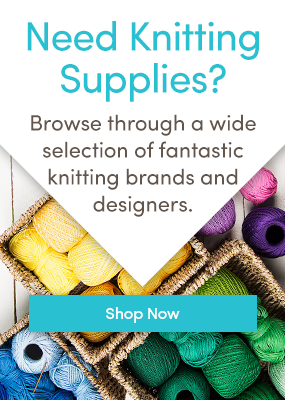 You’ll never lose your knitting supplies again! If you have some mohair or novelty eyelash yarn hanging around in your stash, you can certainly make this cute little rascal! Standing about 3 inches high, Peanut the Hamster is perfect as a gift or as a gift to yourself to adorn your home. You could also use a wool DK weight yarn and brush it to give it a nice fluff. Break out the yarn stash, this little hamster needs a home! This fabulous FREE pattern from Wendy Neal (click here to see all her amazing patterns!) uses remnants of 4 ply or sock weight yarn in any number of shades you desire. The pattern uses short rows to shape the striped wedges, and one half of the shawl is worked from the top out, while the other half is picked up as you go. The pattern includes written instructions and a mini-tutorial on how to wrap and pick up stitches. How adorable is this knitted narwhal? You can use any weight of yarn to create this little unicorn of the sea; when you use DK weight yarn it will measure 12 inches (30 cm) from the tip of the horn to the tail. The pattern includes instructions on how to make a narwhal or a great blue whale, and the instructions for knitting the horn are detailed with photos. Many knitters have odds and ends of sock yarn rattling around in their stash. This fun sock pattern has 4 lace charts and were designed to look amazing no matter which combination you choose, whether you make up some zigzag socks or intersperse the lace panels with plain stripes. You could knit the socks to match or use different patterns and colors to make them related but different – go crazy! These socks are worked from the top down with a short row heel. Using small amounts of DK weight yarn, you could make a pear or an apple pincushion to grace your crafting area! Both are knitted flat and seamed up, apart from the stems which are icords knitted on DPNs. The pattern includes detailed instructions, photographs, explanations of stitches and techniques, and an inclusive materials list. Knit a basket for your stash with your stash! Using jersey yarn (or recycled t-shirts! ), you could make this adorable basket, which uses short row shaping, a seamless construction, and the kitchener stitch to graft it closed. Jersey yarn is very durable and self-supporting, perfect to use as a container! This headband is perfect in winter or in summer, due to the airy lacy design. Using approximately 60 yards of worsted, aran weight yarn, this chunky, graphic lace is fashion forward and chic. The headband fastens with a button at the back, to save your hair from getting messed up! Check out these best buddies from the farm! Bramble the Goat is knitted with a slip stitch pattern to give him an interesting texture, and Chestnut the Cow is knitted with some striking stripes. This pattern contains detailed instructions for both of these farmy friends, along with an extensive materials list, in-depth photographs, and explanations of stitches and techniques. Both are knitted flat with worsted, aran weight yarn. What’s the state of your stash – do you need some spring cleaning stash busters? Tell us in the comments below! Last updated: May 21st, 2015. Truly wonderful pieces of knitting art. this has prompted some pumpkin ideas for me. thank you. from my sister’s deceased estate. I don’t knit! Can you suggest patterns for baby or craft items suitable for this amount of 8ply cotton, and supply the pattern/s please – for me to hand on to someone who knits a bit, but no computer. She would be happy to knit a few small things, for our street stalls or fete.